Loving Vincent is a 2017 experimental animated film about the life and death of Dutch post-Impressionist painter, Vincent van Gogh. The world’s first fully painted film required over 100 classically-trained oil painters to paint with oils on canvases (same as van Gogh’s style) on each of the 65,000 frames used in the film. The actors had to first film the entire movie, and the artists had to craft the animated paintings over the images after the filming of the movie ended. This added a layer of creativity because it allowed the viewers to still recognize the actors’ portrayal and appeal through the painted scenes. This gem is a one-of-a-kind visual mirage of vivid whirls and colors, enriched by the artists’ hard work and renditions of van Gogh’s masterpieces such as the celebrated “The Starry Night” and “Sunflowers”. This work of art stars Polish theatre actor Robert Gulaczyk on his first big feature, Douglas Booth, Jerome Flynn, and Saoirse Ronan. The film garnered many accolades and was nominated for the Best Animated Feature at the 2018 Academy Awards. Blade Runner 2049 is a 2017 neo-noir sequel to the 1982 beloved sci-fi film, “Blade Runner”. This is the story of a replicant/bioengineered human who discovers a mystery that leads him to another replicant who has been missing for the past thirty years. The 2017 version is progressive and poised in tone through its muted gray, blue, and yellow visual imagery and cutting-edge effects. The non-cliche setting of a rainy and gritty future Los Angeles added texture and depth to the visuals. It stars Ryan Gosling, Robin Wright, Jared Leto, Dave Bautista, and Cuban actress Anna de Armas in her first breakout role. Harrison Ford also returned to his role from the first movie. The film was praised by critics and won the Best Cinematography and Best Visual Effects at the 2018 Academy Awards. Dunkirk is a 2017 war film written and directed by Christopher Nolan (known for spectacular films such as “Inception” and “Interstellar”) that portrays the British soldiers’ retreat to Dunkirk, north of France during World War II in three aspects: land, sea, and air. Nolan crafted the movie from the perspective of the characters, aiming to use stimulating imagery instead of the usual narrative. With the director’s signature non-linear sequencing, paired with impactful visual storytelling, Dunkirk has been constantly praised as one of the greatest war films of all time, and maybe even Nolan’s best work as of yet. It stars Fionn Whitehead on his first major role, Tom Hardy, Kenneth Branagh, Cillian Murphy, and ex-One Direction singer Harry Styles in his film debut. This war epic impressed many, and won the Best Editing at the 2018 Academy Awards. The 2015 action movie and reboot of the Mad Max franchise is about a post-apocalyptic wasteland where the protagonist/captive partners with a fellow survivor to escape from a fortress run by a tyrant leader. The cinematography of this film is stellar. With its dynamic blue and orange hues during a six-month long shoot in the deserts of Namibia, and gripping action scenes that banked on effective execution and actual stunts, critics have hailed the film as one of the greatest films of the 21st century. The film stars Tom Hardy, Charlize Theron, Nicholas Hoult, Rosie Huntington-Whiteley, Zoë Kravitz, as well as Riley Keough. The movie even got the chance to be shown through an out-of-competition screening at the 2015 Cannes Film Festival in France, and won the Costume Design, Production Design, Makeup and Hairstyling, and Film Editing categories at the 2016 Academy Awards. This 2014 comedy film written and directed by Wes Anderson (known for artistic films “The Royal Tenenbaums” and “Fantastic Mr. Fox”) centering on a concierge who befriends the lobby boy to prove that he is not guilty after he is wrongfully accused of killing an affluent hotel guest. 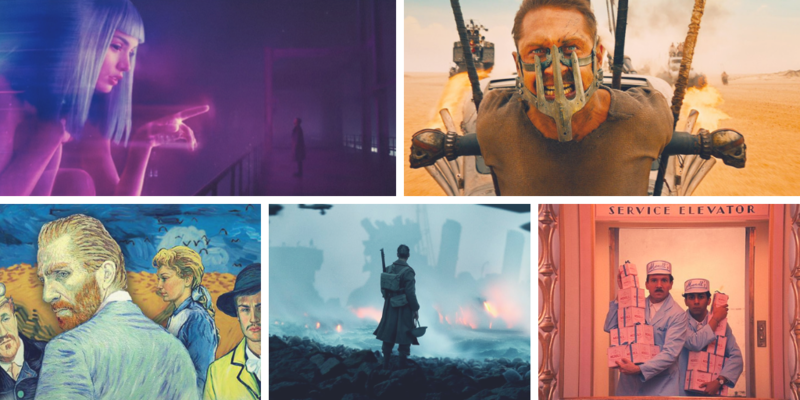 The visuals of the movie are seamless—the color palette is dreamlike, the production design is quirkily stylized, and the flawless framing of shots are all a testament to Anderson’s distinct and zany artistic eye. It also features an ensemble cast of Ralph Fiennes, Tony Revolori in his first notable role, Adrien Brody, Willem Dafoe, Jeff Goldblum, Jude Law, Bill Murray, Edward Norton, Saoirse Ronan, Jason Schwartzman, Tilda Swinton, Tom Wilkinson, and Owen Wilson. The movie is a cult favorite, and has won the Best Costume Design, Best Makeup and Hairstyling, and Best Production Design at the 2015 Academy Awards. Okay, now that we know which movies are perfect for viewing on a smartphone. The next question is, do you know where to watch them? We got the answer! Watch it at the V11 for visual stimulation and entertainment. Its sleek 6.41-inch Super AMOLED display has a 19.5:9 aspect ratio, which is vivid with life-like depth and texture. It also has exceptionally vibrant colors and stunning clarity for the best mobile experience. The Halo Fullview™ Display features a 91.27% screen-to-body ratio that delivers a convenient and an uninterrupted viewing experience that turns your video into a high-quality one at anytime, anywhere. Enjoy your favorite movie at Vivo V11.